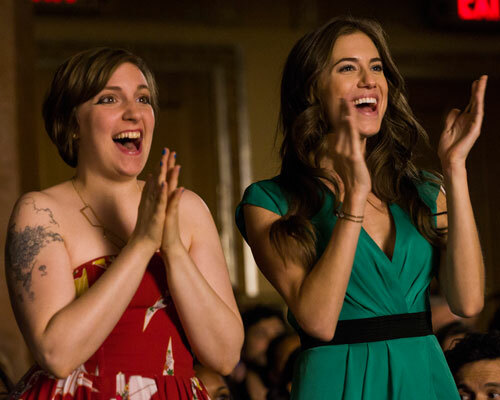 The leading ladies of Girls have been posting up a storm on social media –which is giving us all the feels — as the show wraps up its final week of filming… ever. The latest photo, which includes two of the girls and their body doubles, is making us do a serious double take, distracting us from the fact that Girls is almost over! On Thursday, Allison Williams, who plays Marnie Michaels, and Lena Dunham, who both created the show and stars on the series as Hannah Horvath, revealed their body doubles are pretty much dead ringers for them. Okay, no really, but like, SISTERS at the least. In fact, Girls writer, director and producer, Jenni Konner, posted a group shot of the girls and they look so similar. "Our faithful, loyal and lovely stand-ins for all of these years. Today they had their first speaking parts on Girls and many tears were shed. #endofgirls," Konner wrote alongside the trippy photo. The photo shows Williams with her double, Lytle Harper, on the left, while Dunham holds onto her double, Cara Guglielmino, on the right. There are definitely tears, because of the emotions that are surrounding the end of Girls, which will air its final season (Season 6) beginning in 2017. Williams also shared a picture from her last day of filming thanking Harper for always being by her side. "Today, I dusted off my stand-in skills and stood in for MY stand-in for the last 6 years, @lytleharper. She has stayed in a pool, the Long Island Sound, out in the cold, and in Booth Jonathan's TV installation -- ALL for much longer than I did," Williams wrote. "She works SO hard and has such incredible hustle. Love this woman so much, and I'm so glad she will be memorialized forever on screen as part of our family. #EndOfGirls." Lytle and Gugielmino have been stand-ins for the Girls’ stars since the beginning, and during the final season you’ll actually get to hear them speak as waitresses in one scene! This isn’t the first time however, that these two doubles have posed with their on-screen partners. Lytle has posted numerous photos on her Instagram hugging Williams, as they celebrated premieres and wrap parties over the year. Gugielmino, who is an actress and dancer, has also shared her love and affection for Dunham and the Girls’ team on social media throughout the show. Most recently she posted a sweet photo with Dunham after they wrapped Season 4. Which double do you think looks most their on-screen counterpart? Are you ready for Girls to wrap?